Tune to an IMSA live stream this year, and you’re likely to see or hear about Forgeline Wheels. Although these high-end wheels seem like the product of one of those German companies devoted to navigating labyrinthine homologation rules and employing jumpsuit-clad workers named Klaus, their origins are much more humble. 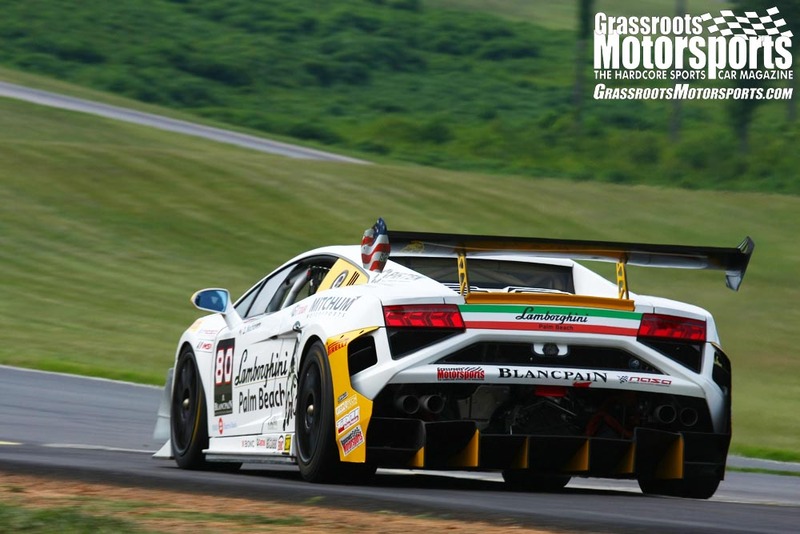 Despite a big-time role in modern racing, Forgeline Wheels are made right here in America, with roots that stretch back to paddocks full of club racers, not factory-backed drivers. 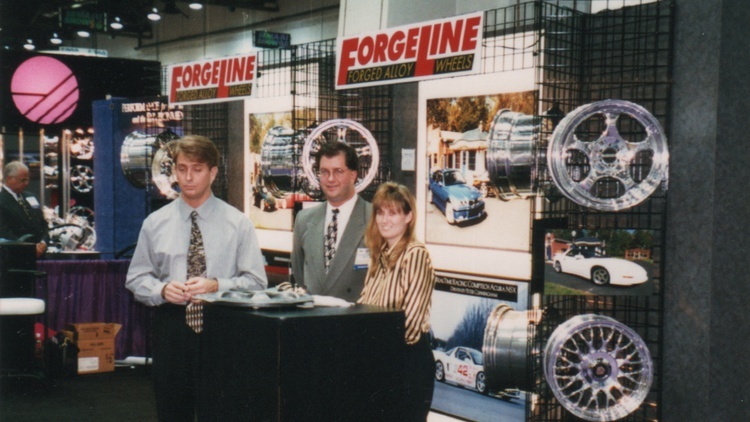 Now 25 years old, this is the story of Forgeline Wheels. This industry’s best David-and-Goliath stories always seem to come from frustrated racers, and that’s exactly what spawned Forgeline. Two fraternal twins, Steve and Dave Schardt, were frustrated by the lack of options for racers looking for custom wheels. Sure, the factory-backed teams could call BBS and have anything they wanted built, and the dirt track crowd could get any size and shape of steel wheel built, but that left a gigantic hole in the market. Road racers looking for custom sizes and offsets couldn’t afford BBS wheels, and didn’t want to carry the extra weight of steel options. Steve and Dave, both racers themselves, faced the same issue. Dave had started a wheel selling business called Wheel Source, and couldn’t find any quality, customizable wheels at a reasonable price. Like so many other racers, he’d found that gap between cheap wheels and expensive offerings from BBS. But Steve and Dave had an ace up their sleeve: Family history. Their father, Jim, owned Dayton Wire Wheel, and is widely credited as the reason for that iconic brand’s success. He was also a racer, meaning Dave and Steve had grown up in a wheel company every week and in a paddock every weekend. That’s how Steve found himself starting Forgeline in 1994, convinced they’d come up with a better mousetrap. They had. Their process started with the center of the wheel, which Forgeline would forge. However, rather than forge a disc of aluminum, they forged what looked more or less like a roughly-finished center, which meant they could skip the expensive machining required to cut the spokes and avoid a bunch of wasted material. And rather than make the rim, too, Forgeline purchased those from an outside supplier. The rims would then be heated, dropped around the forged centers, and cooled. The result was then welded together, culminating in the first Forgeline wheels. They were strong and light, but also much less expensive than the other forged offerings on the market. 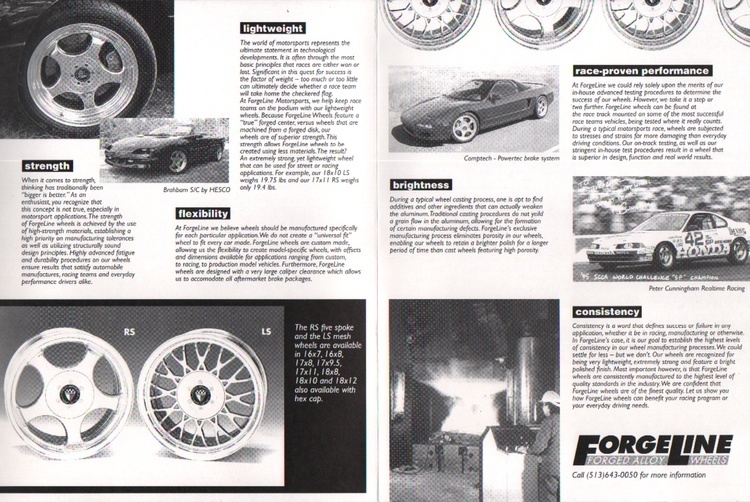 In the early days, Forgeline’s assets sheet listed one old lathe, one two-axis mill, and a used Bridgeport. They were literally building wheels one at a time by hand, but they were building some seriously nice wheels. They needed to sell them, though, or else the efficient process they developed would be wasted on shelves of unsold inventory. So the Schardts did what they knew best and started walking paddocks, eventually signing their first big team: P.D. 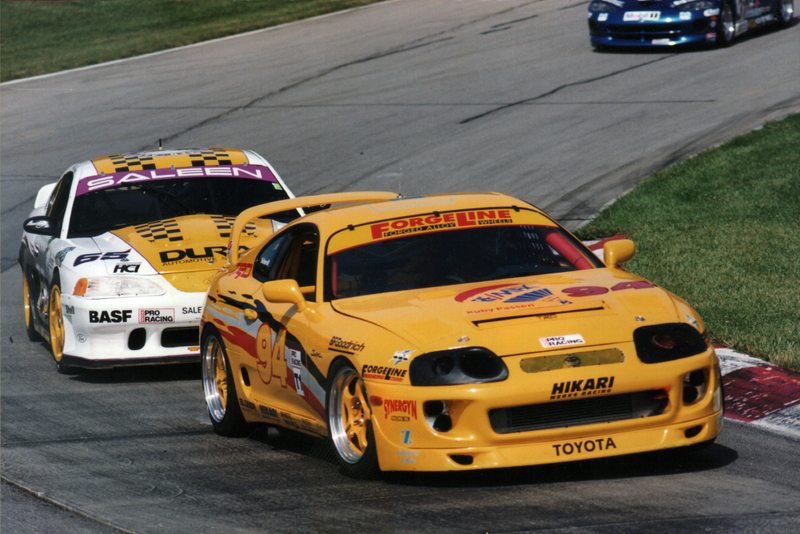 Cunningham, the famous Honda driver and owner of RealTime Racing, agreed to run Forgeline wheels on his World Challenge Honda Prelude. Cunningham won the championship in 1995, and he was thrilled with the wheels. Teams started flocking to the young wheel brand. They were not only affordable, light, and strong; Forgeline also could build the custom offsets teams required while still managing to clear big front brakes. 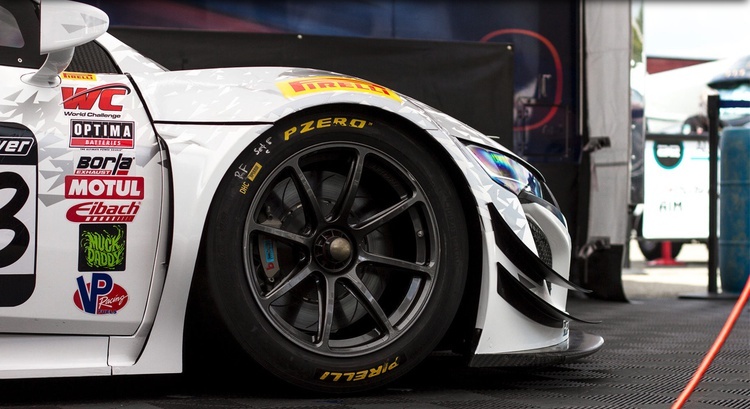 Within a few years, 50% of World Challenge teams were running on Forgeline wheels. Forgeline had found its home in the market, and Dave closed Wheel Source to focus full time on Forgeline while Steve took a break to pursue other opportunities (he returned to the company six years ago, and the brothers have worked together ever since). But there was something on the horizon that couldn’t be ignored: Tires. Specifically, they were getting stickier and stickier. 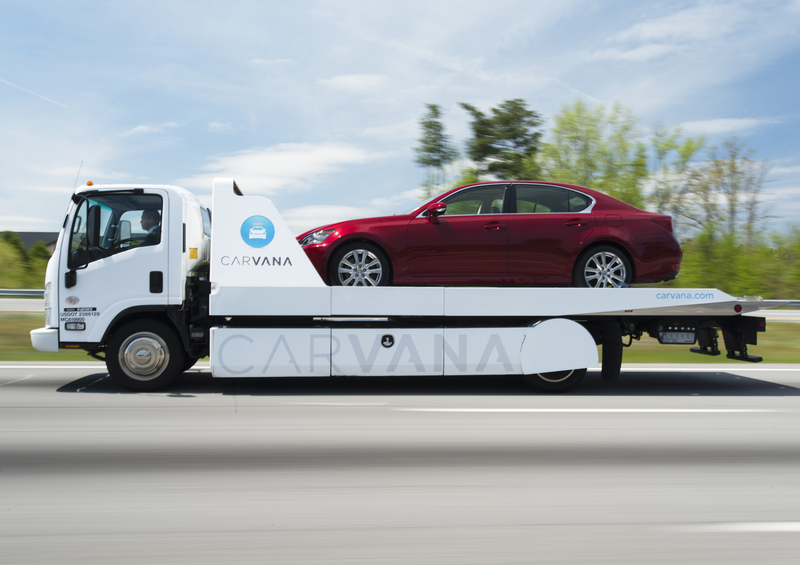 Sticky tires coupled with heavier and heavier cars meant that a new technology was needed. Forgeline couldn’t rely on its welded wheels anymore. Three-piece wheels are called that because they are that. Specifically, they’re composed of an inner rim, a center, and an outer rim bolted together to make one wheel. Three-piece wheels are significantly more expensive to buy and make, but Forgeline now had the expertise, experience and engineering talent to play in a market once dominated by BBS. Forgeline bought a new CNC machine, and started each three-piece wheel with a forged disc of aluminum rather than the forged-in-shape blanks they’d been using for their welded wheels. They were now machining each spoke from scratch. They changed rim suppliers, too, finding a manufacturer that could build 6061-T6 rims (the same material as the centers). This combination allowed Forgeline to offer an unprecedented number of fitment options while still being lighter and stronger than the original design. Despite being more expensive, the new three-piece wheels sold well. Racers had realized the limitations of traditional wheels and modern tires, and seemed to be willing to pay the difference. Forgeline expanded in the opposite direction, too: One-piece, fully-forged wheels were added to the catalog at about the same time as the three-piece offerings. One-piece wheels are the stiffest and lightest option, even if they can’t be customized to the same extent as three-piece wheels. Up to this point, Forgeline was still just a race wheel manufacturer. Sure, they’d sold some street wheels, but that wasn’t what they were known for. Thanks to demand more than anything else, the company kept adding styles and fitments, eventually expanding to its current mix: about 50% street wheels and 50% race wheels. Racing at the professional level has changed. There are far fewer P.D. Cunninghams building cars in private shops, and far more teams buying homologated cars to run in homologated series (like the 2019 IMSA Michelin Pilot Challenge). What’s that mean for Forgeline? The days of walking the pro paddock to hock wheels are mostly behind us, but Forgeline boasts homologation by many of the manufacturers, including Ford and Chevy. Teams can’t buy wheels from Forgeline, but they can buy Forgeline wheels from Ford. Go figure. 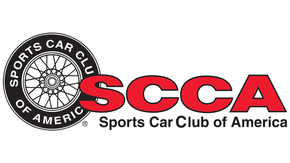 The company says they’re actively working with other OEMs to become an option on their race cars, too. Forgeline has been making strides on the street as well. They developed a seriously impressive line of wheels with carbon-fiber rims, but it proved too successful for the aftermarket: A car company that can’t be named bought the technology. Forgeline had to start over with a new design for carbon wheels, and those are currently available in sizes geared toward modern exotics. They also continue to add new sizes and styles of traditional forged wheels, with more than 100 styles currently in production. Despite all this growth, the company still builds every wheel at its Dayton, Ohio headquarters. From humble club-racing roots to the leading edge of wheel design and development, Forgeline’s first 25 years have been quite the journey. Tune in to watch the 2019 IMSA Michelin Pilot Challenge live stream, and you’ll see Forgeline proudly represented both as a sponsor and as one of competitors’ favorite brands. While you’re watching, Forgeline will be working: As Dave and Steve say, they’re just getting started. You can check out all of their current wheels at Forgeline's website. What Makes Forging Better than Casting? In the most basic language, casting is when metal is melted and poured into a mold, while forging is when metal is heated and forced into a shape. While they both achieve the same result (metal in the desired shape) the strength of the resulting metal varies significantly. A materials scientist could write volumes about the topic, but here are the basics: Casting introduces some negative possibilities like porosity, shrinkage, and foreign inclusions. Forging produces a more uniform grain structure and eliminates the risk of porosity. Forging is a more difficult and more expensive process, but it results in a stronger, more durable, more consistent part. In the context of wheels, Forgeline tells us there’s another advantage, too: Whereas a cast wheel will normally experience catastrophic failure when it breaks, a forged wheel will normally experience an air leak. We’ll let you decide which you’d rather risk on track. true story: i had Forgelines on my $2002 Challenge corvair. The owner of Forgeline raced Corvairs forever, so he made a few sets of 13x7 for (iirc) his ITA car, and I bought one of his used sets. I have Forgelines on my FD. They came free with the car but were over $600 apiece when new. I would never have purchased them myself though. The are the same model (LS) as pictured in the bottom right under the "Meet the Brothers" photo in the linked article. Wow... he must have sold them at an incredible discount since the price for the cheapest wheel they sell is well over half the budget. An 8-spoke Minilite style wheel would be a nice addition to the classic line - since finding Panasports can be a real pain (not helped by possibly the worst website on the web). i had 25% of my budget in those wheels and the used race tires that came with them. I felt like a low-level super hero the first time I picked up an 18X10ish Forgeline with one hand. Then I realized that it was like 20lbs and I was not as super as I'd initially thought. Trans Am Race Engineering makes some nice Panasport/Minilite style wheels. 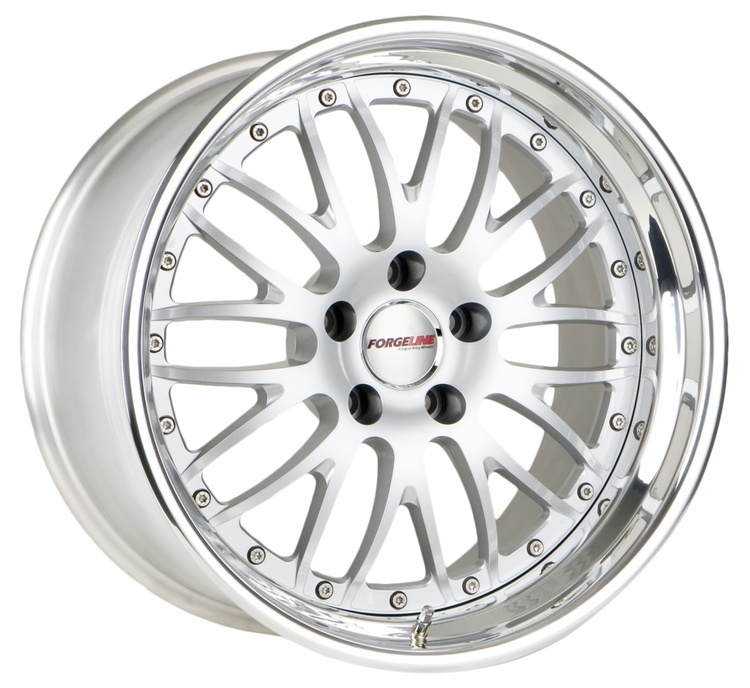 I've got them on my 1969 Cougar in 17x8. Check out Superlite in Australia. They'll basically make any size/offset/BCD you want and are inexpensive. I had a staggered set made up for my GT6 a decade ago. While I like top shelf parts as much as anyone, and am not afraid to spend money when it helps the end goals of the car, I am definitely on the fence when it comes to wheels. Much as I like having the strongest, lightest wheel possible (being able to spec them to my liking is definitely nice! ), some of the nicer lower end of the market wheels have come a long way. Best example I can think of is the RPF1.